Phil Mickelson was part of a five-way tie for first place when second-round play was suspended due to heavy rainfall Friday at the AT&T Pebble Beach Pro-Am in California. 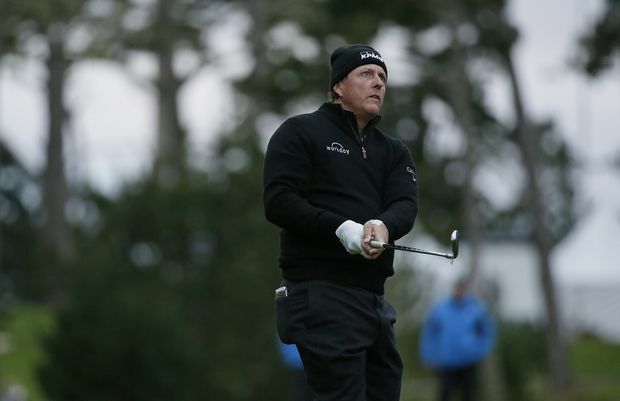 Mickelson posted a 4-under 68 at Spyglass Hill before the heavy rains began, accompanied by increased winds. Jordan Spieth and Scott Langley were also at Spyglass Hill on Friday, with Langley in the clubhouse at 10-under while Spieth was through 16 holes when play was suspended. Lucas Glover shot a 6-under 66 at Pebble Beach to reach 10 under and England’s Paul Casey turned in the low round on Friday with a 64 at Monterrey Peninsula Golf Course. Phil Mickelson follows his approach shot from the 10th fairway of the Spyglass Hill Golf Course during the second round of the AT&T Pebble Beach National Pro-Am golf tournament on Feb. 8, 2019, in Pebble Beach, Calif.
Brian Gay, who was tied for the first round lead with Langley, struggled to a 72 at Spyglass Hill on Friday and is tied for eighth. Mickelson is a four-time winner of the event. Two-time champion Dustin Johnson was 2-over on his round at Spyglass Hill to fall to 3-under for the tournament with two holes in his second round remaining. In his previous four victories, Mickelson was the leader or co-leader after 36 holes twice, tied for third once and tied for eighth once. Mickelson said that while he is coming off a disappointing 2018 year, he made an adjustment that saw him pick up 5-6 mph in his driver speed, leading to increased confidence off the tee. “That rarely happens to anybody, let alone to somebody in their late-40s,” he said. “That led me to be pretty optimistic leading into this year. I think that’s going to lead to some good things. Tour rookie Cameron Champ was on the 18th hole when the horn sounded. He opted to finish out the hole, chipping onto the green and then having the grounds crew squeegee the path to the hole with standing water on the green. Champ hit the putt, with the ball splashing into a cup completely full of water to get to 2-under for the tournament. NOTES: The 2019 U.S. Open will be conducted at Pebble Beach for the sixth time in June. ... Korean Ho Sung Choi, whose unique “Fisherman Swing” has made him an internet sensation, shot a 3-over 75 at Spyglass Hill and finished the day in a tie for 128th. ... Defending champion Ted Potter Jr. is at 12-over and tied for 153rd with one hole remaining in his second round at Pebble Beach.